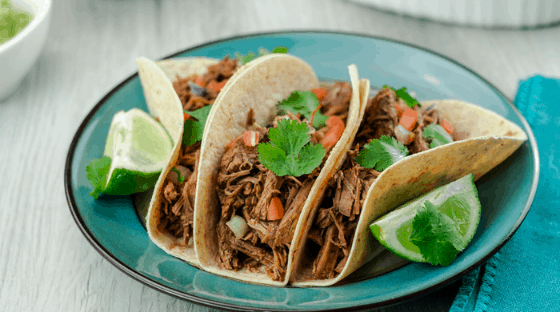 A delicious and easy dump and start Instant Pot recipe for beef barbacoa tacos that can feed a crowd. This is a really simple recipe to make using your Instant Pot and it ready incredibly faster than using the slow cooker method. I saute the beef before adding everything in the pot because it gives the beef a nicer texture and added flavor. You can just add everything into the pot if you want to, I just prefer to brown my beef first. I always blend my ingredients in my food processor when making this meal because the sauce is smooth and not chunky. It can be made by adding diced ingredients but it will change the consistency of the finished meal. Serving freshly made pico de gallo, guacamole, freshly sliced limes, and cilantro really completes this meal! You can also serve this meal over rice, as a beef bowl, or even use barbacoa in lettuce wraps. This recipe makes enough for at least 8 servings so it’s perfect for feeding a crowd! Setting up a bar with choices of toppings is sure to be a hit and everyone will find something they would like as a topping. I use about 5 tbsp of the chiptoles in abodo sauce when I make barbacoa beef. If you want it on the milder side, reduce the chipotles to 2 tbsp instead. If you want a lot of heat in this recipe, add more than the 5 tbsp of chipotles that I add… it will be spicy! Delicious and flavorful beef barbacoa tacos made in the Instant Pot. In a food processor, blend together the garlic, lime juice, cumin, cloves, chicken broth, apple cider, chiptoles, and oregano until smooth. Trim fat from the beef and cut into 6 chunks of meat. Add oil to the Instant Pot and set it to SAUTE. Saute all sides of the beef until browned. Scrape bottom of the inner liner so remove anything sticking (will prevent burn notice). Top the beef with chopped onions. Pour in the blended mixture and lay 3 bay leaves on top of the beef. Close the lid and set to MANUAL for 65 minutes. Remove beef from the Instant Pot and shred. Add back into the pot, stir the beef into the juices and serve with a slotted spoon.